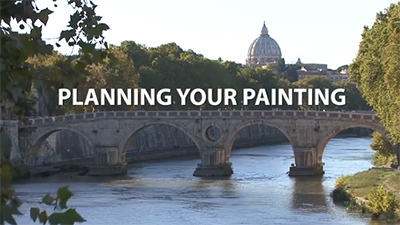 In this film, Karen concentrates on being comfortable with the medium and choosing and painting everyday subjects. 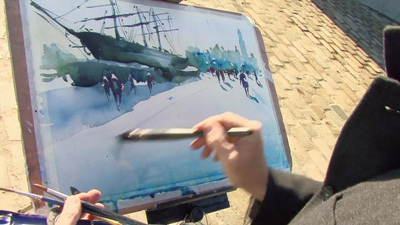 Following an initial studio session of watercolour techniques, Karen suggests the many different subjects to be found in and around the house. These range from breakfast dishes on the table and flowers and pots in the conservatory to garden clutter and a figure resting in the sitting room. 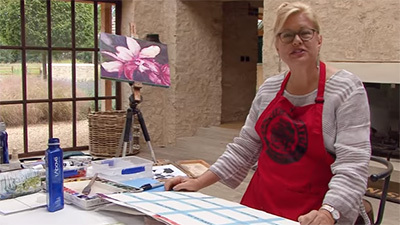 Those who have seen Karen Simmons's earlier videos - on portraiture, on flowers and on gardens - will know her love of glowing, bright colour and her fresh and lively approach to the art of fluid and fluent watercolour painting. 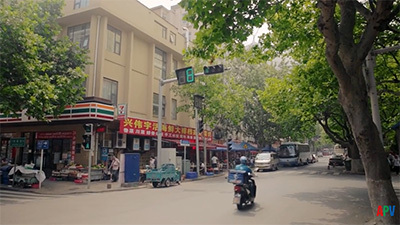 In this, her fourth video - At Home with Watercolour- she draws our attention to the wealth of subject matter that may be found around the home - everyday objects that are so familiar they are overlooked. Karen starts with a studio session of watercolour techniques and we see how a white garden chair painted in masking fluid, over which a greenish wash is applied, suddenly comes to life when the dried latex is removed. She uses Bockingford paper and most of her work is done with a well pointed, well laden No. 14 round brush. A marguerite is outlined in the palest wash, leaving the bloom itself untouched, and deeper colour is added and spreads over the wetted paper to produce a simple but telling image. She shows us how she tackles greens, which she mixes herself, by first applying yellow and then adding cobalt so that the blending occurs on the paper - a technique she frequently uses to good effect. She applies washes of permanent rose, gamboge and cadmium red side by side, so that they blend together and we see how far more interestingly this works than pre-mixing the three colours in the palette. She then demonstrates how pigment travels over a wet surface by sketching with a wet brush and then dropping in strong brown pigment at key points to produce a lively image of a sapling. 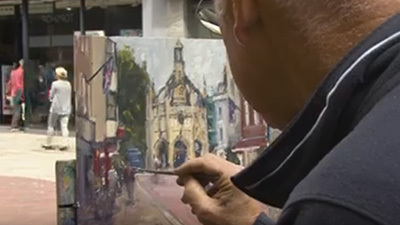 The greater part of this one-hour video is taken up with four demonstration paintings. Her first subject is an informal group of breakfast crockery - haphazard, to avoid any suggestion of a contrived arrangement, but containing an eminently paintable yellow teapot and mugs, patterned milk jug and a vase of sweet peas. Plenty of scope for fresh,bright colour, with the greys mixed from these colours to ensure overall colour harmony. The background is treated loosely and softly to avoid competition with the still life group. 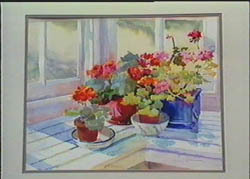 Her second demonstration features a group of potted geraniums and begonias arranged on a white slatted seat in her conservatory again plenty of scope for rich, vibrant colour, but an opportunity, too, for subtle tints as the white woodwork reflects some of the adjacent glowing lines. Her next subject shows how such homely objects as a watering can, a hose reel, some potted plants and seed trays against a blue painted door and a garden background can provide plenty of inspiration for the imaginative artist. 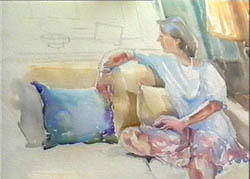 Her final demonstration painting, of an attractive young woman seated on a sofa, gazing out of an adjacent window, shows the artist is as comfortable with the human figure as she is with still life and flowers. 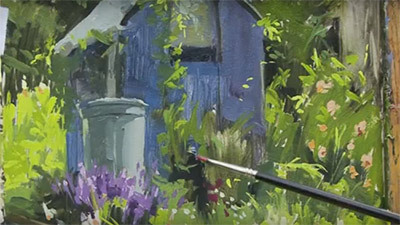 Karen's pleasant personality and informative commentary perfectly complement her fluent watercolour style and this is a video I can recommend with confidence to still life, flower and figure painters alike. It is well and professionally made and the accompanying music is pleasant but unobtrusive. 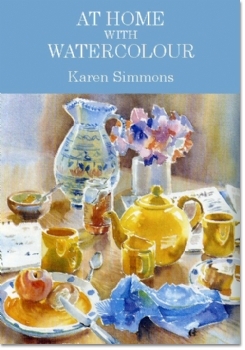 At Home with Watercolour is the last video made by Karen Simmons before she died in August . It shows us that those 'ordinary' subjects which we daily disregard around the house and garden can really be quite exciting and inspiring. 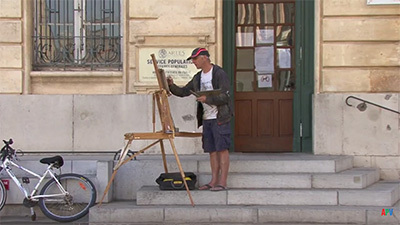 The video starts with a studio problem-solving session, which includes how to create whites and highlights and using those "dreaded greens", before moving on to four demonstrations: breakfast dishes on the kitchen table; flowers and pots in the conservatory; a garden 'clutter' still life; and a figure study. "Don't arrange it, just find it," is her message and the video reminds us of her delightful enthusiasm, her fresh and flowing technique and her constructive advice.